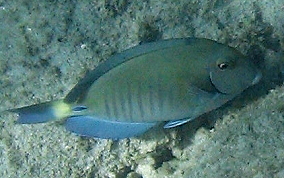 The Doctorfish is a member of the Surgeonfish family. The Doctorfish always has bars on his body, the Ocean Surgeonfish does not. Their color can change from the light bluish-gray to a dork brown. The Doctorfish is less common then the Ocean Surgeonfish. 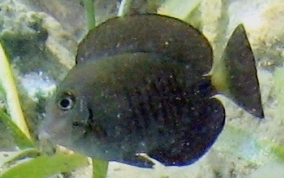 The Doctorfish may have yellow-white band at the base of the tail. 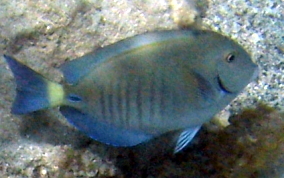 As a member of the Surgeonfish family, the Doctorfish also has poisonous spines on either side of the body, just in front of the base of the tail. 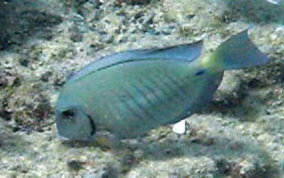 Doctorfish will often school with other Surgeonfish and Blue Tang.